Friday March 19th 1920 Weather unpleasant. The girls were home most all day. I was down to Fannies a little while. Hattie was in town to a little party. Rob had trouble with the car in the [wind?] at supper time. Saturday March 20th 1920 After an early dinner we went to town in the car. The Engineers Parade was on. Later I did some errands and walked down to the depot. Blanche and Robert went home. They brought me to the bridge in the Auto. Hattie & Cora came later. They were home in the evening. A long letter from Lydia. Sunday March 21st 1920 Weather pleasant. The girls went to church. I was down at Otts a little while. I wrote Ida in afternoon and in the evening wrote to Ann Henslee, Cal Eggleston, Ella Nagle, and The Reed girls. Hattie to church. Rob & Cora to the store. Monday March 22nd 1920 weather pleasant. The girls did some more washing. Hattie had Ott & Fannie invited for supper. Mollie Stevens was over to stay all night. I was crotcheting some. 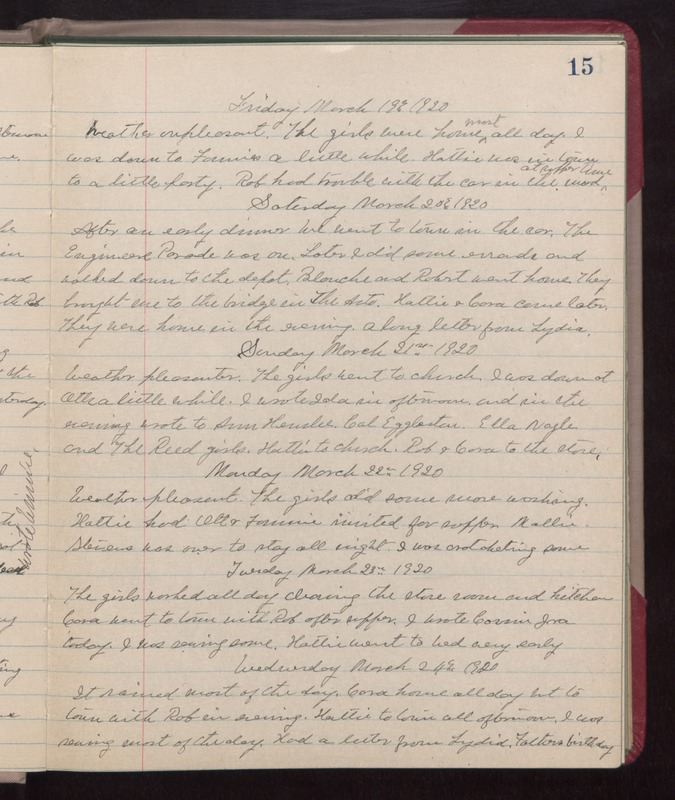 Tuesday March 25th 1920 The girls worked all day cleaning the store room and kitchen Cora went to town with Rob after supper. I wrote Cousin Ira today. I was sewing some. Hattie went to bed very early. Wednesday March 24th 1920 It rained most of the day. Cora home all day but to town with Rob in evening. Hattie to town all afternoon. I was sewing most of the day. Had a letter from Lydia. Fathers birthday.